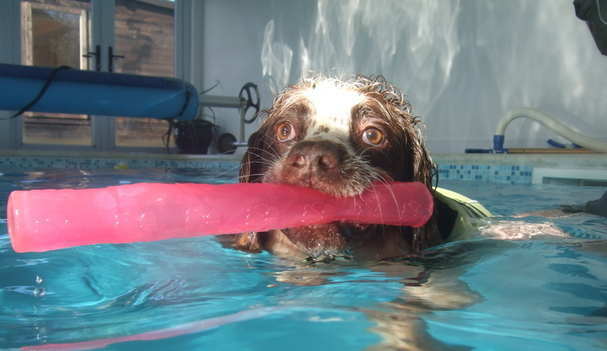 When our eldest English Springer Spaniel was diagnosed with Hip Dysplasia and Elbow Dysplasia, we trained as Canine Hydrotherapists at Greyfriars Rehabilitation & Hydrotherapy Centre in Guildford in 2008 and bought an above-ground swimming pool in which to treat him - the main aim being to increase muscle tone around his hip joint. 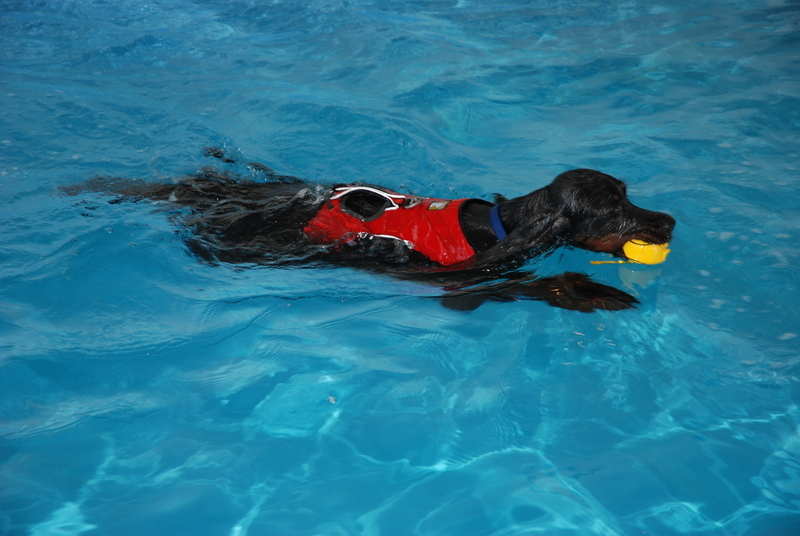 With regular swimming and gentle walks, we were able to keep him mobile and mostly pain free, in addition to keeping his weight down and maintaining his fitness levels. We've also been able to treat two of our rescued springers - one with deformed paws and the other with Cruciate Disease (partial tear). Sadly, our youngest springer also developed Cruciate Disease (complete rupture). We have been lucky enough to avoid surgery, with a full recovery. Hydrotherapy can successfully be used in the treatment of arthritis, some spinal/neurological conditions, many orthopaedic conditions and soft tissue injuries. It can also help with general convalescence and all round fitness. In human physiotherapy, results have shown that a suitably monitored course of hydrotherapy acts by encouraging a full range of joint motion in non weight-bearing conditions, thereby improving muscle tone and promoting tissue repair without imposing undue stress on damaged tissues. Swimming helps to improve general fitness, muscle tone and helps in recovering from injury or surgery and can also help with weight management. Interestingly, muscle wastage begins within 3 days of any immobilisation so to prevent further weakness or injury it is important to rebuild, through safe exercise, any muscles that have deteriorated. 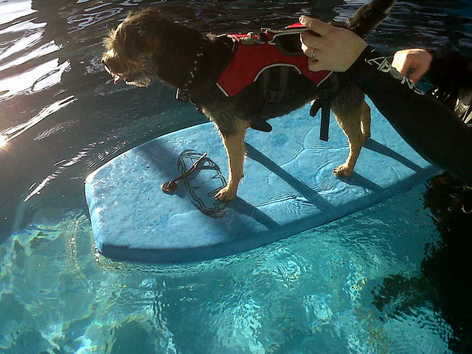 It is far better to swim dogs in heated water since cold water causes constriction of the blood vessels near the skin and to the superficial muscles which restricts the flow of blood making the muscles less efficient. Hydrotherapy is also thought to be a natural anti-inflammatory through its ability to reduce tissue swelling. 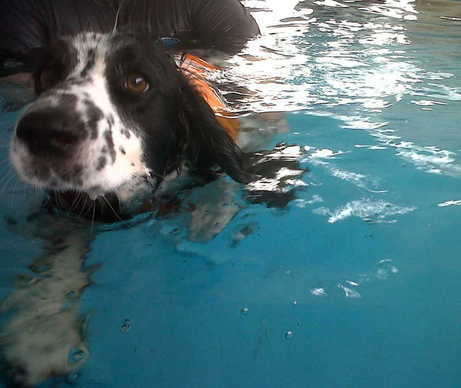 In conjunction with veterinary treatment, hydrotherapy can significantly improve the quality and rate of healing following surgery or traumatic injury. After surgery careful swimming activity can help with rehabilitation and increase the chance of a successful return to full fitness. 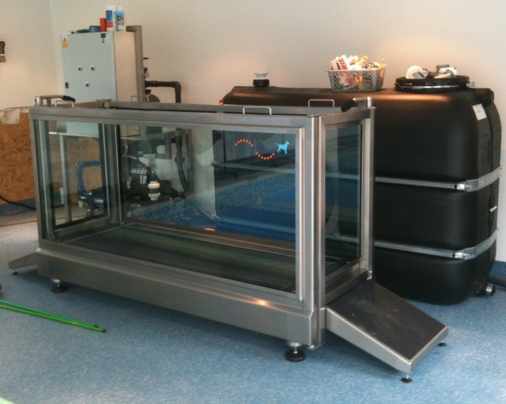 Both our pool and water treadmill are heated to a temperature of between 28º and 32º celcius (82.4º - 89.6º F). The quality of the water at our centre is extremely important to us. We use Chlorine plus a UV filter for sanitisation.